Original Mixed Media Acrylic Art On 24x24”Canvas By Elizabeth, Title: abstract flower life.This is an original one of a kind acrylic canvas on canvas signed by the artist (Me). The colors are predominately purple with a mixture of blue and teal. I love colors and shaping them into something that is open and adventurous and inviting as wall art for your space, hope you do too!!! This was painted with a brush as well as a sponge. The fun part was mixing the colors into a cohesive whole into a painting that that is complete. Mixture of ink and watercolor. Condition: Very good condition, with no major problems to report. 12" tall x 15" wide. Subject: Abstract Garden Still Life. Mixture of ink and watercolor. Condition: Very good condition, with no major problems to report. Displays very well! 11.5" tall x 9.25" wide. Mixture of ink and watercolor. Condition: Very good condition, with no major problems to report. Displays very well! 15" tall x 12" wide. 9.75" tall x 7.75" wide. Olga Stepanek. 1906-1998, Lincoln, Nebraska artist. size: 13"×6". The piece is titled "Building Again" and was done in the early 1980's (1982, to be exact). There are no breaks, cracks, dents, dings, etc. 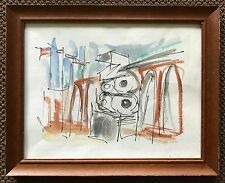 Listed Artist Seymour Zayon Mixed Media Acrylic on Newsprint "Construction #23"
Born in 1930, contemporary Philadelphia area painter Seymour Zayon is known for his colorful abstract compositions. Circa late '70s. It's ready for display. GERI TAPER BRAUNSTEIN 1921-2004. ONE SMALL TEAR TO MARGIN AS PICTURED. HEAVY WEIGHT PAPER - CORNER OF PAPER EMBOSSED WITH VERITABLE PAPIER D'ARCES - SEE PIC. RED SKELTON. THE RED SKELTON HOUR was on 1954 to 1962. with MICKEY ROONEY at 5'2" and BEA BRAGLEY at 6'6". MICKEY went through the ladies like a knife through fudge. this is just one of my one of a kind piece of art work original signed collage. It is signed and dated 1982. It is an underwater fantasy inspired by her many snorkeling adventures. 12 6/8 x 15 2/8. I think the protective layer is glass. Glass and mirror tile mosaic pyramid artwork. Shows the Third Eye or Illuminati Eye in a pyramid. Measures 13" x 15". (33.02cm x 38.10cm) Good condition. Ki Davis (American, 20th C.) abstract paper collage, circa 1970’s, mounted on white board and framed in metal frame matted under plexi-glass. Signed lower right in white pencil. Measures 40.5in x 29.5in framed and about 36in x 25in image only. Davis exhibited in Chicago as well as Aspen Colorado in the 1960’s through the 80’s. Davis also completed a large sculpture commission for the City of Aspen in 1979. .
Peter Max " Sage and Profile Ver I #17 ". Baterbys Art Gallery. Where Art is Passion. Variety, quality and authenticity are what you will find at Baterbys Art Gallery. About Baterbys Art Gallery. 2017 -Baterbys Art Gallery. Signed Richard Royce 1971 "Renewal" Cast Paper Artwork in Floating Frame 14"x14"
Original Signed & Framed 1971 Cast Paper Artwork by Richard Royce Titled "Renewal" & Signed "Richard Royce 71" Framed Dimensions: 14" x 14" Condition: Very good vintage condition artwork. Frame shows minimal and normal wear; artwork on wove paper with some light toning and small paper markings. Please be sure to check the detailed listing images to determine the condition for yourself. W3. Since 1950 Pranas has been living in Paris where he was a student of Fernand Lėger and also studied lithography at the Ėcole National des Beaux Arts. He is equally strong in oil painting, water colors, and graphics where his finesse, love for detail and composition is outstanding. Made by Zajednica Milosrdni OTAC. Hand Signed Original Modern 1987 Mixed Media Art in Shadow Box Called "Magic"
The main color consists of black and white with pink and light grey accent. Hand-signed and dated in the right corner. It does not have the Certificate of Authenticity, but it is genuine. This was an estate buy. This is a wonderful gift for an art lover! I have another work by the artist listed also, entitled "Kol Sasson" including a COA. Compliance-CA Prop 65 Chemical Lead. Includes three wall decor. Like the flowing stems on a dandelion, this set of three organic inspired wire wall flowers can be hung on the wall or used as tabletop displays. About Kathy Sheldon Kathy shows her art work at multiple art fairs such as The Ann Arbor Art Fair, Art & Apples Festival, Paint Creek Arts, Columbus Ohio Winter Fair, Kalamazoo Institute of Arts. Appears to be various shapes of paper put together as a collage and then painted over. It is signed by the artist, Dennis Lange, in the lower left-hand corner of the artwork (see photo). The artwork is in excellent shape with no problems to report. Signed on back. In good condition, hinge and adhesive residue on back of sheet. (C. of Attrib.). Was a French-Portuguese painter. Noted for blurring the lines between representation and abstraction, Vieira da Silva's paintings are produced in a limited palette. Her compositions often consist of checkerboard or grid patterns, layered on top of one another to create spaces reminiscent of interior rooms or aerial city views. Tomas Sanchez. SIGNED : Yes, Tomas Sanchez hand signed. Cuban Masters Art Gallery. · All art pieces are listed at the fairest art market price and 100% free from any speculative pressure. ORIGINAL ART SERIGRAPHY. MIXED MEDIA VERY EXCLUSIVE EDITION OF 25 PIECES ONLY! Lovely individualized textures! 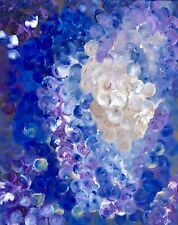 Simply Beautiful detailed Collage Oil /Acrylic on Canvas Panel Board art! Debbie Stairs Abstract Textile Wall Sculpture : Titled "Tides"
By artist Debbie Stairs. Original Abstract Textile. Signed and titled by the artist on back.